Installation on the PC was typical, with two twists: First, you were given the option of installing the entire CD on your hard drive, a whopping 500MB. Don't do this unless you want to use the computer only for ADAM! Second, you are asked at time of installation if you want "modesty" fig leafs to appear over certain anatomical features in the drawings. Leaving them off might provide a basis for answering some of your children's questions, but the choice is yours. ADAM: The Inside Story has very clear drawings and descriptions. Although based on work the people at ADAM Software had previously done for higher education, this software is not a textbook or reference replacement -- its simply too uneven in its coverage of the body systems. That said, it is a wonderful supplement to a textbook for a child studying human anatomy, physiology or biology. One notable shortfall as an educational tool, is that the software does not provide a print function for its many drawings. ADAM told our reviewers that this feature was available in the more expensive school version of the software. Is it fun? Yes, if your child is interested in really learning this subject. 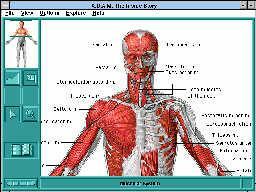 The Inside Story is an excellent piece of software for 7th to 10th or 11th graders interested in learning about the human body. With over 4 hours of animations and dialog (clipped into small pieces on different subjects), this program is fun to explore. And if your friends don't know what phagocytosis is, you can tell them it's the name for the process the body's macophages use to eliminate foreign bodies and cell debris.